In order to make a mask that will fit over eyeglasses it is necessary to move the lenses away from the face. The further the lenses are from the eyes, the more restricted one’s vision becomes, so to counter this I make the lenses larger for eyeglass wearing masks. Before making this mask—which I am calling Bubonis—the only plague doctor masks that we made which could accommodate eyeglasses were Maximus and Jackdaw. Both of them have larger lenses than Classic, Krankheit, Stiltzkin, and Schnabel. 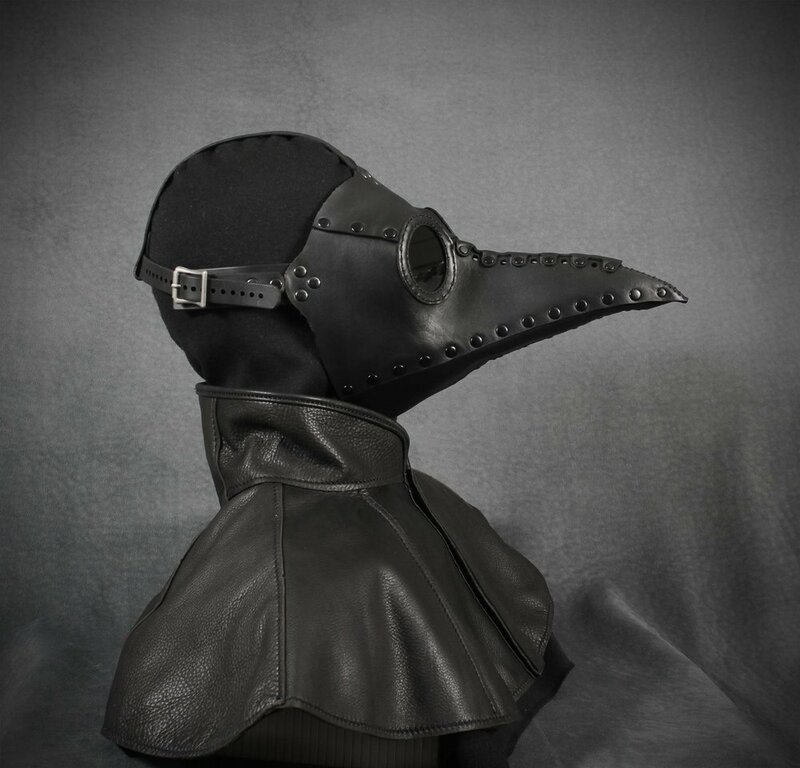 To sum it up, Bubonis (named after the bubonic plague) is a riveted leather plague doctor mask similar to Krankheit but with larger lenses and a longer beak. It has two rows of ventilation holes (one on the upper beak, one on the lower beak), hand-stitched acrylic lenses, and an adjustable strap. We offer it in both black leather with gray lenses and white leather with red lenses. I recently received a request to make a Krankheit mask that could accommodate eyeglasses. As I felt that such a mask would be desired by other eyeglass wearers I decided to make one and add it to our line of plague doctor masks. The Krankheit mask--like its cousin Schnabel--is assembled primarily with rivets. This makes it faster to make than our hand-stitched masks and therefore less expensive. Another design consideration when moving the lenses forward is the effect it has on the beak. The same length beak will look shorter as the tip is now closer to the lenses, and so I have lengthened it a bit to keep the right proportions. We are offering Bubonis at a reduced introductory price. You can order it here. The watercolor sketches to the right are my design of how I thought it should look. The gray color represents an antiqued black leather, the red color would be out of veg tan leather that is painted, and the yellow color would be out of cold cast brass. To create the helmet I began with a life-casting of a head, covering it in Plasticine to form the shape of the finished piece. Next I brushed a fast-setting resin over the clay so that tape would adhere to it, and proceeded to cover it in masking tape. With a felt marker I laid out the seams and cut the tape along those marks to create my individual patterns for the leather pieces. I don't have time to accept many commissions, but when this one was offered I jumped at the chance because it sounded like fun. The job was to create a Judge Dredd helmet in a steampunk look. The client provided several sketches, and I took it from there, attempting to envision how Judge Dredd would have looked in the 19th century. For the shield I studied pictures of 19th century eagles and flags and combined the two into a pleasing shape. I laser engraved this design into a piece of acrylic sheet. Then I molded it in silicone rubber and cast it in cold cast brass. After demolding, while the part was still warm and pliable, I gave it a slight curve by draping it over a bucket. The ear covering was made by laser cutting the cross bars into a piece of veg tan leather, wetting it and stretching the leather over a drawer pull to get the concave shape. Then I molded it and cast it the same way as the shield. Tom Banwell has been a working artist for most of his life, parlaying his self-taught leather-working and resin-casting skills into a living by making hats and trophies since the 1970s. But it wasn’t until 2008, at the age of 60, that he found true creative success and recognition in an unexpected place—the retro-futuristic fantasy world of steampunk. Steampunk is an emerging aesthetic rooted in late 19th-century science fiction of the Jules Verne/H.G. Wells variety, complete with its own subculture known for elaborate costumes and homemade machinations, mixing Victorian and Old West-era fashion with a touch of post-apocalyptic devolution. Banwell, known mainly for his elaborate masks, is currently one of its brightest stars, with his work featured in numerous television shows (Smallville, Once Upon Time, Wonderland to name a few), films (indie feature After the Fall), more than half a dozen books on the genre, and international art shows. Though his name is now associated with steampunk, Banwell wasn’t even aware it existed until six years ago. While looking at the work of other mask-makers, he noticed one artist who used the word “steampunk” to describe her work and, unfamiliar with the term, Googled it. 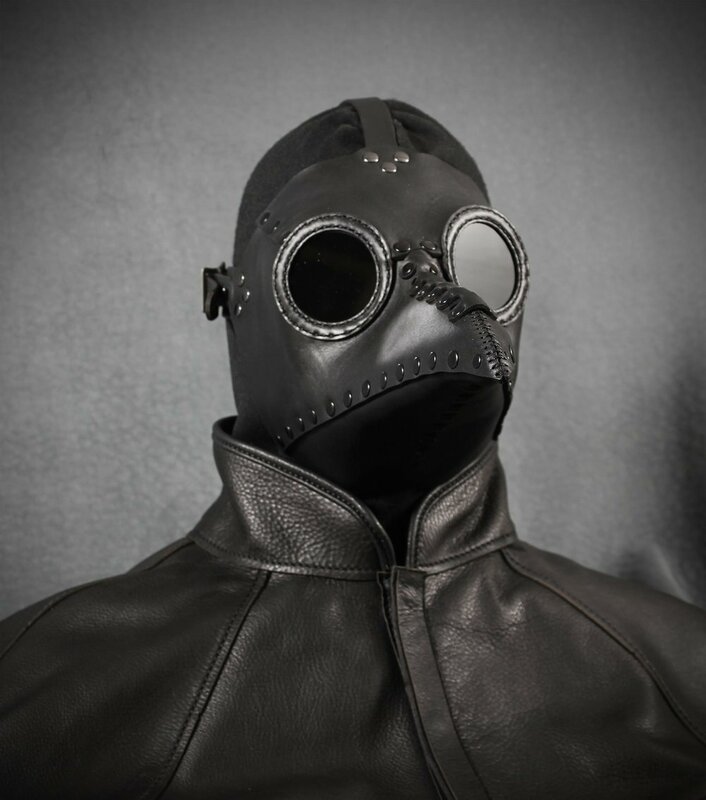 Soon after, Banwell stumbled across a World War II gas mask, and decided to take a shot at the genre, casting components based on the mask’s respirators and goggles, adding bits of metal, and tying it all together into stitched-leather head gear straight from a land of nightmares. He now makes gas masks in various designs, some resembling animals like elephants and aardvarks, and his signature, bird-billed “plague doctor” masks. He also makes filigreed, lacy-looking leather-cut masquerade face coverings that are as feminine and elegant as his darker works are terrifying. Banwell started selling his masks through his online Etsy store, and business remains brisk—his creations ranging from about $40 for the masquerade-style pieces up to around $400 for gas masks. Critical acclaim also came fast, and less than a year into mask-making, his creations were featured in the first European steampunk art show, at England’s Oxford University, in 2009. Another recent show in which his work appeared—in Seoul, South Korea—was the first steampunk-themed display in Asia, and was so well-received it is now engaged to move to Beijing soon. Because decades of Banwell’s career were focused more on commercial ventures, and success came late and fast, he missed a few major pit stops along the way, one of which he’ll be achieving with his upcoming local showing at Idea Fabrication Labs—his first solo gallery opening. Banwell admits it’s been strange to find a following and “be discovered” at the age of 60, and credits his late success largely to the Internet. An array of mounted heads will adorn the walls at The Idea Fabrication Laboratory, 603 Orange St., on Saturday. It's not as macabre as it sounds, but Tom Banwell's "Masked Machinations" isn't without it's decidedly macabre inspirations. Banwell, 66, is bringing an impressive offering of nearly 70 of his steampunk-inspired headpieces and leather masks to Chico's cutting-edge art space. Steampunk style and culture pulls from an alternate timeline of possibilities — a Victorian-style reinterpretation of the world, where ornate craftsmanship and a fascination with early machines meet and prosper. In a steam-powered world, gadgetry resembles clockwork and nothing is without it's own flair. Banwell's pieces are perfectly suited for the modern man or woman on a time-travelling journey to a grim portrait of a plague-infested London as it looked at the turn of the century. The "Ichabod," a plague doctor's mask, features a custom cold cast aluminum crane's beak and laser-cut metal eyepieces with shaded lenses. 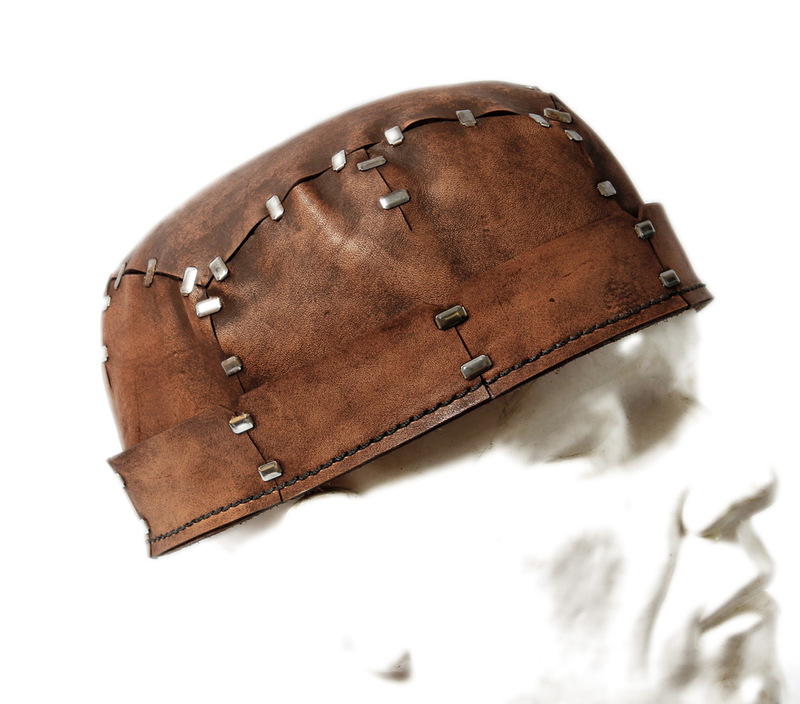 The wearer's face and neck are covered in premium leather hand-stitched together with waxed thread, of course. The UC Berkeley grad has been honing his craft for decades, his background studded with woodworking, resin casting, laser cutting and his main passion, leather working. Banwell made everything from sandals to coats at a shop in Tahoe before launching his own leather hat business in the '70s. His designs were successful but his creativity and interest in the style of a dramatically different world developed into Tom Banwell Designs, a leading provider of stunning costume creations. Banwell utilizes old world and repurposed materials, modern technology and masterful craftsmanship to deliver a huge line of leather masks and headgear. Jordan Layman, one of the Idea Fab Labs founders, puts Banwell in a league of his own. "He's one of the most talented people to come through here, " Layman said. "He has been at it for so many years, he's achieved a level of mastery." Banwell is also the first artist to put on an exhibition at Fab Labs without a residency at the facility beforehand. He chose to forego the Labs' leather and woodworking studio and laser cutter and work from his own impressive studio in Penn Valley, complete with two laser cutters, a resin casting setup and industrial leather tools. This will be Banwell's first solo show in 30 years, not to mention the first time he'll be seeing his rather large collection out in one place. The artist has custom designed displays for his numerous pieces, adapting the Fab Labs space into a veritable steampunk boutique. The show will also feature windows to Banwell's own realm of inspiration. Poster-sized photo illustrations feature soldiers in Banwell's leather and metal gas masks and models with brass ray guns. Not all of the pieces are so heavy though. The warehouse gallery might resemble a masquerade ball with a broad variety of Banwell's lighter, laser-cut leather masks paired with the facility's colorful LED ceiling. Clusters of hearts, simple superhero silhouettes and bold geometrics in an array of colors build into more dramatic pieces — bird's wings, folded leather rabbit ears and intricate butterfly masks spark flights of fancy. Banwell's upcoming exhibit is sure to provide a little shock and awe for Chico audiences, bringing his dramatically-styled and striking steampunk creations together to give leather a new life in art. When/where: 3-6 p.m. June 28 at Idea Fab Labs, 603 Orange St.
By now you’ve certainly heard of Steampunk—it’s in the dictionary for pete’s sake. You’ve seen movies like The League of Extraordinary Gentlemen and Van Helsing, you’ve noticed little bits of re-imagined Victorian fashion and technology woven through television and comic books and half the costumes at Burning Man. What you may not realize is that along the way you’ve probably seen the art of Tom Banwell. Tom Banwell is a craftsman—an artist who walks between the fantastic and the practical. His leather masks, hats, and helmets typify the strange beauty of a dystopian future that never was: crow-beaked plague doctors, elephant and aardvark-faced mutants who are well prepared for gas attacks, masquerade balls full of woodland creatures and elemental super heroes. His work has made its way into Once Upon a Time in Wonderland, So You Think You Can Dance, Smallville, Gossip Girl, One Tree Hill, The Cape, Vogue Paris, pretty much every book ever written about Steampunk art and costumes, and museum exhibits from Seoul, South Korea to Oxford, England. Somehow, through all that, he hasn’t had a solo exhibition in 30 years. Until now. And, it’s in Chico. By now you’ve certainly heard of Idea Fab Labs—it’s been on our cover for pete’s sake. You’ve seen their incredible maker-oriented exhibits, and heard about their laser cutter, 3D printer, and their stunning, possibly-too-hip to be so far from the Bay LED ceiling—wait, what? You haven’t? You mean you don’t read this paper religiously and remember everything we’ve ever written? Well, to be fair, that cover story was just before I started here, and this paper sucked (kidding!). Coming up on Saturday (June 28th) from 3-6pm, there will be a reception for Tom Banwell’s first solo exhibit in 30 years (I know I just said that, but it’s sort of a big deal and we’ve established that you have a bad memory): Masked Machinations. It’s FREE, suitable for all ages, and open to whomever feels like dropping in and being amazed. I encourage you not to show up wearing your homemade alternate-reality-firemaster mask and helmet, you’ll just embarrass yourself. The Bad Air Transmutator, which I sold several years ago, and was my first respirator, is back. I have altered it somewhat and renamed it simply Transmutator. The cold cast canisters are the same, but the stitching, ventilation holes, and straps are all new and improved. The leather mask and straps are almost identical to my recent Infiltrator respirator. The main difference is the canisters. The Transmutator is available at my Etsy shop. There is still a shapeable wire hidden in the deerskin binding going over the nose, for customizable shaping. In addition I've added a pair of neoprene foam pads which sit against the wearer's cheeks, for additional comfort.